Banana bread is always a good use for overripe bananas. 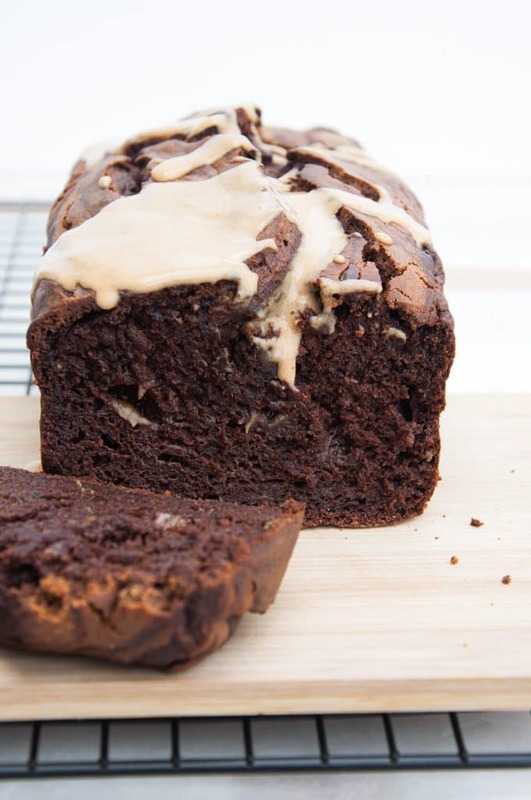 But this vegan Chocolate Peanut Butter Banana Bread is everything you’ve ever wanted! Drizzle it with more peanut butter sauce, just because! 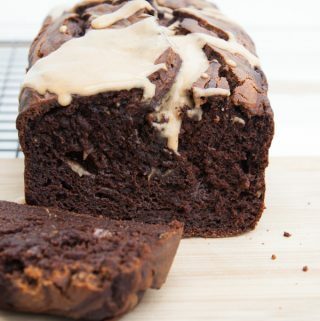 The banana bread is moist, luscious and sweetened only with bananas and maple syrup. It does not contain eggs or dairy. But you won’t notice the difference. It’s just as delicious, soft and fluffy! People always ask me how I can bake without eggs, I just don’t use them, that’s how ;) I don’t know why everyone thinks you need eggs to bake. The bananas in this recipe will do the trick just fine. You don’t need eggs or any weird egg-replacement for binding. 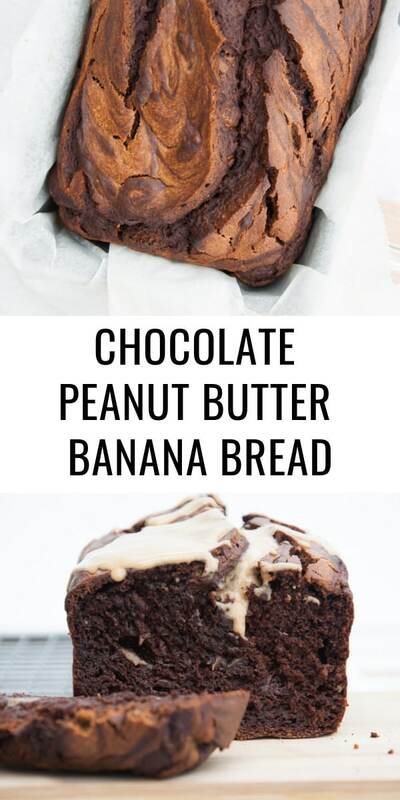 If you’re a lover of chocolate and peanut butter, this one’s for you. There’s a simple trick to how to check if your banana bread is baked all the way through. Use a thin wooden stick or toothpick and stick it into the center of your banana bread. If it comes out clean – with only a few crumbs on it – it’s done. If it comes out with batter on it – bake it longer and try it again later. You can read more about the kitchen hack and see it explained with photos here. Banana bread is always a good use for overripe bananas. 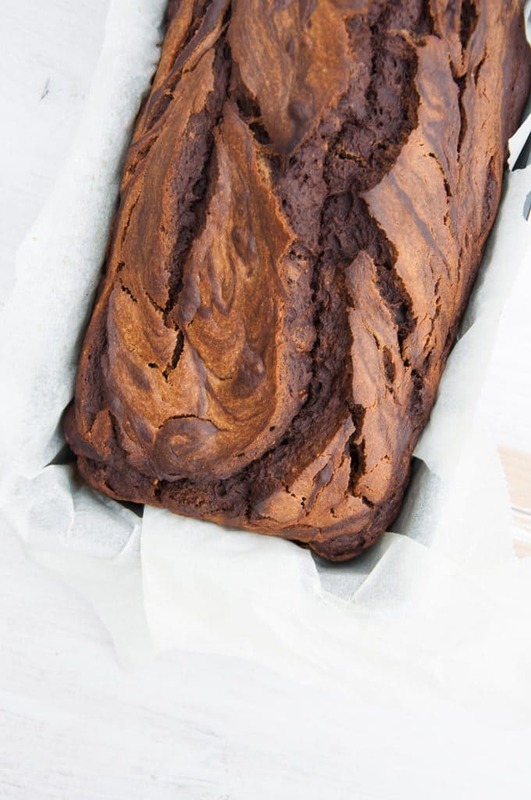 But this vegan Chocolate Peanut Butter Banana Bread is everything you've ever wanted! 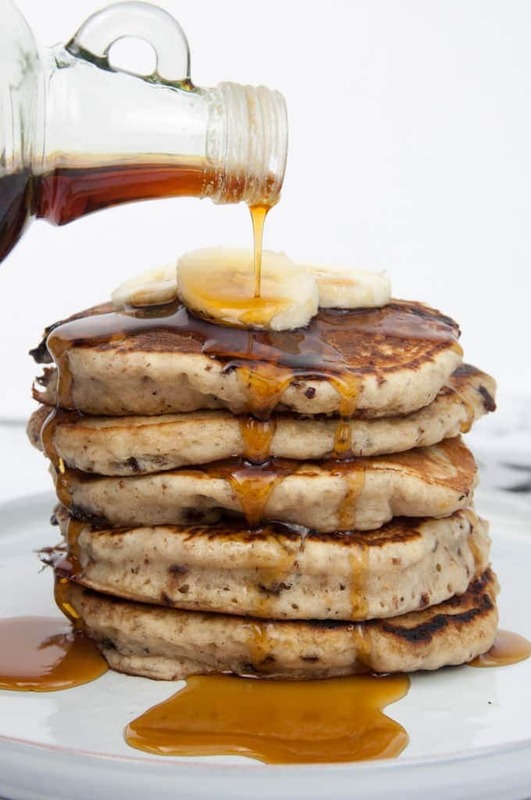 Drizzle it with more peanut butter sauce, just because! Preheat the oven to 320°F/160°C and line a loaf pan** with parchment paper. Add the flour, cocoa powder, baking powder, baking soda, and a pinch of salt to the wet ingredients and whisk everything together. Pour the batter into the loaf pan lined with parchment paper. For the peanut butter sauce, simply whisk together the peanut butter and maple syrup and thin it out with hot water until drizzable. Add 1-2 tablespoons of the sauce to the batter in the loaf pan and swirl around a bit. Drizzle with more peanut butter sauce before serving! 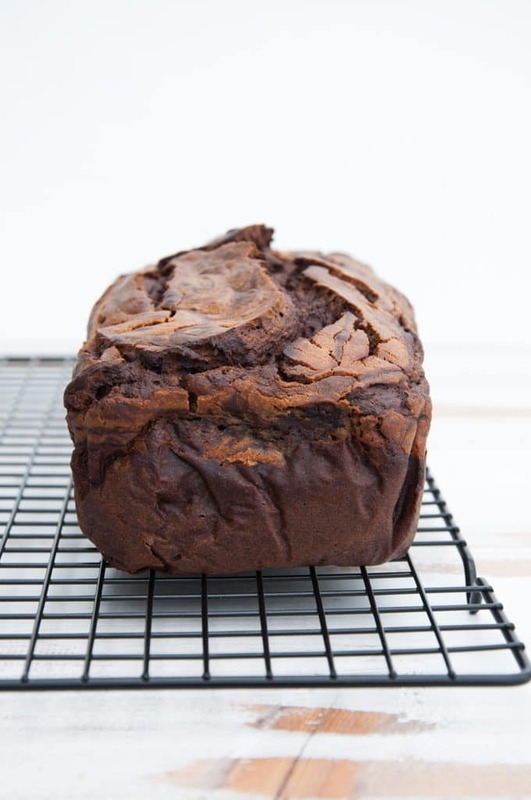 Did you make this vegan Chocolate Peanut Butter Banana Bread? Tag @elephantasticvegan on instagram and use the hashtag #elephantasticvegan. Don’t forget to subscribe to the Elephantastic Vegan Newsletter to see Reader Remake Features! 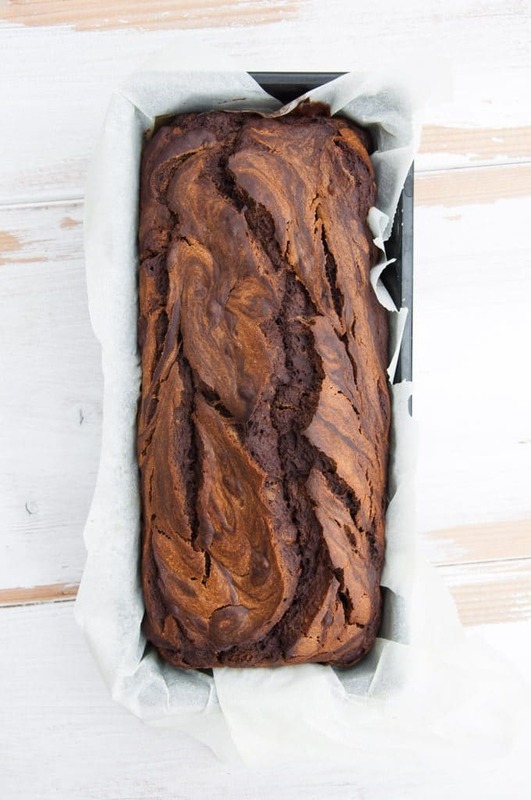 Banana bread perfection! I love that sweet swirly peanut butter sauce! I haven’t made it yet but,could you tell me how long baking should be for 3×7 7/8 mini loaves would be?my sister suggested coffee instead of water for the sauce.thanks for the help. mini loaves won’t take that long – I’m guessing 20-30 minutes! The top should be crackling and the bottom shouldn’t feel dense but light, then they’re done! Thank you for the wonderful review, Marilyn! Glad you all enjoyed it! Hi, I tried the recipe with ripe apricots (instead of bananas) and it works! Thanks for that great idea. I made it. I tasted it. I went back to this page to see if i missed sugar. WHERE IS THE SUGAR?! It would’ve been soo good with sugar. I can’t believe i didnt notice there wasn’t any in the ingredients list. 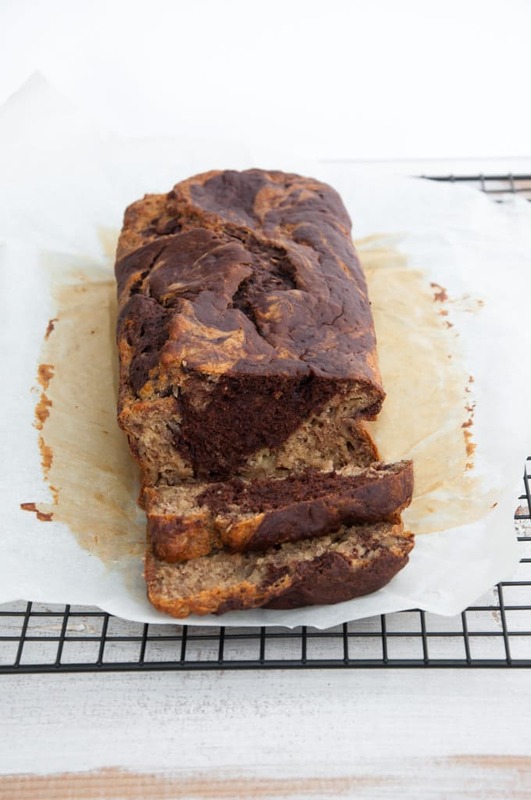 Hi Madison, this banana bread is sweetened with maple syrup and the very ripe bananas add sweetness too. It’s a shame it wasn’t sweet enough for you, did the bananas have black spots when you used them? Maybe they weren’t ripe enough for banana bread yet. Loved this recipe. I added a half cup of sugar when i made it the second time to appease the hubby. The sauce is the bomb. Sugar is definitely a necessity unless you enjoy really bitter chocolate taste. Was very good other than that! I put my bread in for an hr at 320 and it was still very raw! Took nearly two hours to cook not sure what the issue was. Hi Rachel, each oven is a bit different, so I wouldn’t worry too much about it. You could crank up the heat to 350°F. My loaf pan is 10 x 4.7 inch, so if you’re using a smaller loaf pan, this would mean a longer baking time as well. I hope you enjoyed it nonetheless! Can you substitute rice milk with soy milk?? I went on Pinterest to find a healthy Quinoa salad but ran in to this. Forget the salad!! I made this last night, I didn’t have really ripe bananas, but I was so into making this asap so I couldnt wait for them to ripen little more, I was looking forward to make your banana bread for days LOL, I couldn’t help it, so that happened last night… I put all the peanut butter sauce on top of the dough, and I made a ganache out of mini choco chips and some more peanut butter. I brought banana bread with me to work today, and had it for breakfast with some tea, and it was amazing! Thank you for the recipe. I cant wait to bake this again. I am gonna swirl little better next time. It is so moist and fresh and every bite is so darn delicious. They ate everything,grrrr… luckily i have 2 pieces left at home..so the whole loaf is almost finished. Amazing! Nooo, I didn’t tell them, I am not a vegan myself either. My colleague asked me today if i still had some leftovers of yesterday’s “cake” , I had to disappoint him, I had last three pieces for myself with the cup of tea. It was amazing! One more thing tho, I actually put less maple syrup, i put like 1.5 tablespoons, and that was enough for me. I like the taste that is somewhat in between sweet and natural. I cant wait to bake again. Look forward to making this for Monday! Merry Christmas! Yeay! Hope you enjoy! And a merry Christmas to you too! My banana bread does not anymore :) I don’t know what I did wrong but it recently turns out flat. if it turns out flat, maybe the baking powder is expired? 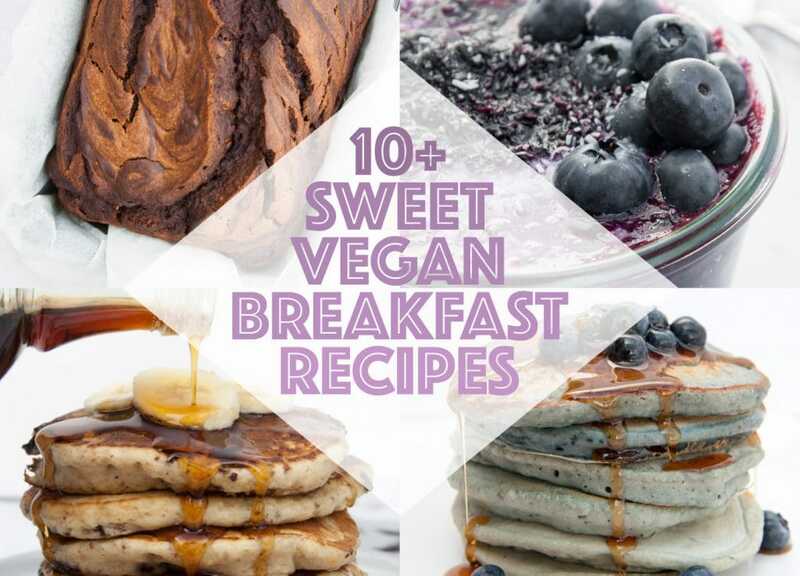 You can absolutely use your favorite sugar! White, brown, coconut :) Maybe you’ll have to add a bit more milk to balance out the wet to dry ingredients. Oh, I’m sorry to hear that, Nikki. Maybe your oven is just more powerful than mine. I’d recommend reducing the temperature the next time and maybe place the banana bread on a lower rack (that way the top shouldn’t get burned). Also, in case you’re using a smaller loaf pan, reduce the amounts of the ingredients, otherwise the banana bread will be higher and therefore will take longer to bake! :) Hope it turns out better next time. Is there any way to bake this without the baking powder or any substitutes I could use? I don’t know why but after take off from the oven it became withered. What should be the reason ?